Mike Park is a Korean American musician and progressive activist. 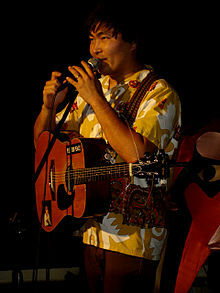 His musical ventures include Skankin' Pickle for whom he both played the saxophone and sang, The Chinkees, The Bruce Lee Band, and Ogikubo Station, as well as an acoustic solo project under his own name. After his time with Skankin' Pickle he went on to found Asian Man Records, a label which he has run out of his garage in California since 1996 with only help from his parents and friends. Asian Man Records supports mostly ska and punk bands. Park will support any band as long as it is "anti-racist, anti-sexist, and anti-prejudice". Park has used Asian Man Records to release his own music, in addition to providing a start for smaller bands to allow them to grow, including Less Than Jake, Alkaline Trio, and The Lawrence Arms. In 1999 he formed the Plea for Peace Foundation an organization whose aim is "to promote the ideas of peace through the power of music", something which Park has been trying to do with his own bands and with the help of other groups. Park was the impetus behind the Spring 1998 "Ska Against Racism" tour. The goal of the tour was to promote awareness about racism and raise money for anti-racism organisations such as the Museum of Tolerance. The national tour included The Toasters, Less Than Jake, the Blue Meanies, Mustard Plug, Five Iron Frenzy, MU330, Kemuri, and Mike Park himself. The Plea for Peace Foundation was founded in 1999 by musician and founder of Asian Man Records, Mike Park. The Plea for Peace Foundations is a 501C3 Non-Profit Organisation based in San Jose, California, in the United States. The organisation's stated goal is to "promote the ideas of peace through the power of music". Initially the foundation was only active in national and global music tours, but in 2007 it intends to open a youth center for children where they will be encouraged to "perform music, create art, dance and talk to others of similar interests". In 2004, Plea for Peace organized a musical tour of the same name. The tour was a stand against President George W. Bush and the wars in Iraq and Afghanistan. Park grew up in Silicon Valley in Northern California, where he still lives. He majored in music in college. He is a Minister of the Universal Life Church. Karaoke with the Chinkees 7"
^ Inoue, Todd (January 1998). "Secret Asian Man". Metroactive. Retrieved May 13, 2010. ^ Steininger, Alex (April 1998). "Ska Against Racism". In Music We Trust. Retrieved February 17, 2007. ^ Hajdu, David. "Where Has "Where Have All the Flowers Gone?" Gone?". New Republic. Retrieved 4 December 2011. ^ "PIONEER OF THE THIRD WAVE SKA REVIVAL, 99.9 PER CENT INDIE MAN: INTERVIEW WITH MIKE PARK". koreanpop.com. September 11, 2007. Archived from the original on July 26, 2011. Retrieved July 10, 2009. ^ Punknews.org. "Music: Bruce Lee Band (Bomb the Music Industry!, Skankin' Pickle) announce 'Community Support Group' EP". www.punknews.org. This page was last edited on 2 November 2018, at 05:24 (UTC).